First off being a man I completely disagree with this guys actions and words, this guy gives a bad name to decent men, so with that said check this out. 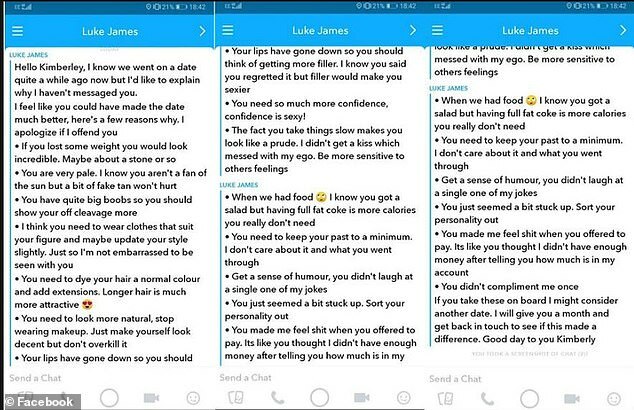 Kimberly Latham-Hawkesford from Morecambe, Lancashire in England posted screenshots of Snapchat messages from some guy named Luke who she went on a Tinder date with THREE MONTHS AGO!! I guess that Luke thought he was doing Kimberly a favor by listing out 15 bullet points of 'improvements' she could make to her personality and her physical appearance to secure a second date with him. I don't know why he thought this was a good idea or why he felt the need to share this information with her in the first place, like dude, you're date was THREE MONTHS AGO? Let her live! She posted the screenshots on her Facebook page with the caption, "Imagine being so far up your own a** you'd send this to a girl 3 months after a date." You should probably prep yourself for his list because it's RIDICULOUS! I just can't believe that this guy had the nerve to send her a bullet point list of things that she needs to "fix" in order to get a second date with him. I can guarantee you that she didn't want to go on a second date with him in the first place. I'm sure if he's acting like this 3 months after they had their first date and she never reached back out to him that he was just as rude in person. This guy is a big NOPE CITY!